Summer is a wonderful season and it the time when you can go out in your favorite shorts and sleeveless tops. However, you feel dehydrated and tired in summers. You want to drink lots of water and juices and you hardly have any appetite. You need to take proper precautions to cope up with the heat of the summer. 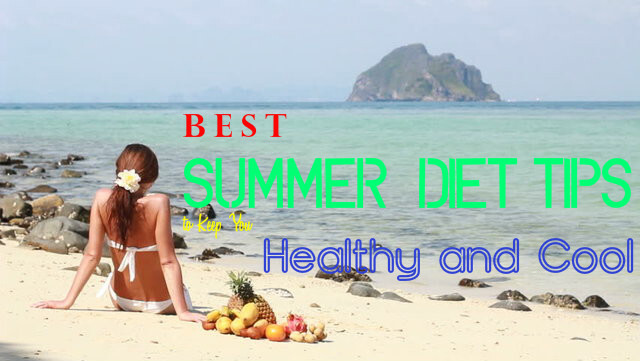 One way is to follow a diet that will help you to beat summer. Below are given some of the foods that you have to take and some that you should not take. Caffeine as well as carbonated and alcoholic drinks contains lots of preservatives in them. They also contain too much of sugar. These are harmful for your body. Aerated drinks are said to contain small amounts of phosphoric acid which can cause damage to the lining of the digestive tract, thus affecting its normal functions. Tea and coffee can cause dehydration of the body and make your face look flushed. Non-vegetarian foods like red meat, eggs, squid and prawns generate heat and therefore they are to be avoided in summers. Having them make you sweat more. They can also cause stomach upset or diarrhea. You can go vegetarian during the summer months and keep yourself cool. Dry fruits are very delicious and nutritious for your body. But they are high in calories and generate heat from your body. So, you will have to avoid it in summers as during this time you need cool foods to reduce the core temperature. You may have dry fruits in winter, when you need to keep your body warm. You have to increase consumption of fresh fruits and reduce dry fruits in summer. Watermelon is great for cooling your body in summers. Peach is another good option for reducing your body temperature in summer. Cucumber is very effective for keeping you cool in summers. You can have them in salads and also as snacks. Cucumber juice is also good for cooling your body. Adding lemon juice to cucumber juice is more effective for keeping you hydrated and cool in summers. Having sugary food causes an increase in body temperature. You should avoid honey and molasses if you want to keep your body cool. Instead, you may take in natural sugars that are found in fruits and vegetables. Some of the natural drinks that you can have in summers are lemonade, coconut water and buttermilk. They keep your body cool and also provide you with the electrolytes that are lost from the body. So, you can drink plenty of lemonade in summers. Dairy products like milk, cheese, yogurt etc also generate heat and therefore you have to recue intake of these foods. Overeating is one of the main reasons for obesity and hypertension .By eating light, you benefit a lot. Avoid having oily and fatty food as it can increase the core temperature and affect the cooling capacity of the body. It is very important that you drink lots of water in summers. It helps in regulating the temperature of your body and also protects your body from dehydration. In summers you sweat a lot. Excessive sweating can lead to loss of water from your body. So, you need to replace it by drinking enough water. The aerated drinks that you get in the market are not good for your health. You can have water or fruit juices. Physical exercises and other strenuous physical activities can increase core temperature interfere with the cooling mechanism of your body. So try to reduce too much of physical activities in summers. You can perform it when it is cooler, like early mornings and late evenings. Swimming is a good exercise that you can perform in summers. It makes you cool and provide good workout for the body. Fried foods are known to increase the cholesterol levels in the body and lead to arterioscleroses. Apart from this, they also contain Trans fat, which can increase the temperatures of your body by preventing you body from dissipating heat. So, try and avoid vadas, samosas and other fried foods if you want to keep your body cool in summers. During hot summer months we all love to drink cold drinks. In fact it does not help in cooling your down. When you drink chilled water or beverages in summer, it leads to the constriction of blood vessels. This leads to a decrease in the dissipation of heat from your body. As a result, the heat is increased instead of getting reduced. Salad dressing and sauces make your meals more delicious and interesting. But they contain more calories and make you feel gloated and sluggish. Instead of using sauces and salad dressing, you can use mint chutney, which can keep you cool and fresh. This doesn’t mean that you avoid hot meals. You can enjoy it as you always do. You have to just refrain from taking vegetables and fruits that help in increasing the temperature of the body. It is recommended that you avoid taking spinach, radish, garlic, hot peppers, onions, grapefruit, pineapple and ripe mangoes. These generate heat from your body. If you love to have mangoes and cannot imagine avoiding it, then you can soak them in water overnight and then have them.